فرودگاه بین‌المللی میامی (به انگلیسی: Miami International Airport) فرودگاهی بین‌المللی است که در شهر میامی در ایالت فلوریدا واقع شده و از پر رفت‌وآمدترین فرودگاه‌های آمریکا می‌باشد. 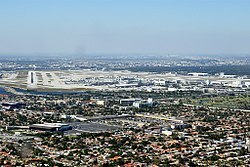 The airport is one of the largest in terms of cargo in the United States, and is the primary connecting point for cargo between Latin America and the world. Ninety-six different carriers are involved in shifting over two million tons of freight annually and ensuring the safe travel of over 40 million passengers, according to the Miami International Airport corporate brochure. It was first in International freight and third in total freight for 2008. In 2000, LAN Cargo opened up a major operations base at the airport and currently operates a large cargo facility at the airport. Most major passenger airlines, such as امریکن ایرلاینز use the airport to carry hold cargo on passenger flights, though most cargo is transported by all-cargo airlines. یوپی‌اس ایرلاینز and فدکس اکسپرس both base their major Latin American operations at MIA. ↑ "Aer Lingus announces new routes to Miami, Porto and Split". RTÉ News. Retrieved ۱۵ نوامبر ۲۰۱۶. ↑ "El Al resumes Miami flight from Nov 2017". Routesonline. Retrieved ۱۵ مه ۲۰۱۷. ↑ ۶٫۰ ۶٫۱ ۶٫۲ ۶٫۳ ۶٫۴ ۶٫۵ ۶٫۶ ۶٫۷ ۶٫۸ "Blockbuster expansion: Frontier to add 21 cities, 85 routes". USA Today. July 2017. Retrieved ۲۲ ژوئیه ۲۰۱۷. ↑ "Cargo Traffic 2010 Final". Airports Council International. 1 اوت 2011. Archived from the original on ۲۹ سپتامبر ۲۰۰۷. Retrieved ۷ ژوئیه ۲۰۱۲. ↑ "Gateway to the Americas" (PDF). Miami–Dade Aviation Department. 27 ژوئن 2012. Retrieved ۷ ژوئیه ۲۰۱۲. ↑ Miami-Dade County Online Services. "Miami International Airport :: Cargo Airlines :: Miami-Dade County". Miami International Airport. این صفحه آخرین‌بار در ‏۳۱ مهٔ ۲۰۱۸ ساعت ‏۱۴:۱۵ ویرایش شده‌است.